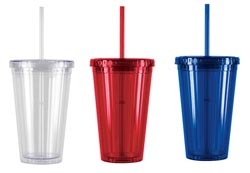 Welcome to EPI Promotional Products printed drink bottle information page. We don't just do drink bottles. If you want to see what else we do go to our promotional products contents page. We manufacture and distribute a huge range of promotional products. Click here to read what you need to know about promotional products and EPI. The general conditions of sale, artwork requirements, freight, time frames etc. Drink bottles are excellent sellers undecorated. However, they also make fantastic promotional products with your logo on them. We have graphic artists to help meet your design needs. Or we can utilise already created art work. See below for more information on artwork. Note the prices below exclude GST (extra 15% sales tax), however, there is no extra tax on exported products. Printing setup $66.50 per colour and/or position. Includes first half hour of artwork. Subsequent extra artwork $75.60 per hour (both excl GST). Repeat prints in the future with no changes are $47.50 per colour/position. Click below to see a mock up of the various colour lids and bottles you can choose. X-Stream Shot 750ml Drink Bottle, EPI Code 2004. Very similar to the Sure Shot drink bottle. See Below for the actual Sure Shot. X-Stream has a much larger variety of cap and bottle colours, plus the possiblility of taylor made colours. Revolutionary Patented Valve Cap Drink Bottle. Various stock colours - red, blue, green, silver, white, yellow, orange, black which can be matched to various top lids.. We can organise to have your logo printed on the bottle. We can also m50 ake bottles of most colours but will need a large run and will need to be specially programmed into production. We can match against specified PMS Colours. If you want a special run (not run in conjunction with other Sure Shots) there is a $200 extra setup charge) - this is only available for X-Stream. Minimum run for special colours - 1000 drink bottles. Note. Prices tend to be exclusive of GST on this website. Each printing job has a setup charge of $66.50 per colour and position. If the job is a reorder and there are no art changes, the setup cost is $47.50 per colour and position. First 30 minutes of artwork is covred in the setup charge, If additional artwork and design is required this is charged out at $75.60 per hour. Most simple jobs will not cost more than the $63.00 setup above. Print Area 105mm x 105mm. 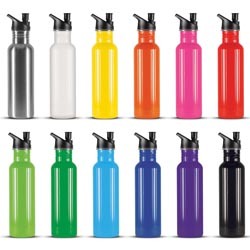 he Action, Super Sipper, X-Stream drink bottles have a huge range of colour combinations. The picture on the right indicates the 144 combinations. Note - Except The X-Stream doesn't have pink or bright green. Dimensions: 275mm x 80mm x 72mm. Print Area: 90mm x 90mm bottom and 15mm x 90mm top. Hydromax Drink Bottle. Our code 2006. DELETED STOCK ITEM... JUST SELLING REMAINING BOTTLES. CAN'T BE PRINTED. 750ml bottle featuring a patented grip area that fits comfortably into most hand sizes plus radical new metallic colours and choice of 12 non metallic lid colours (see below). 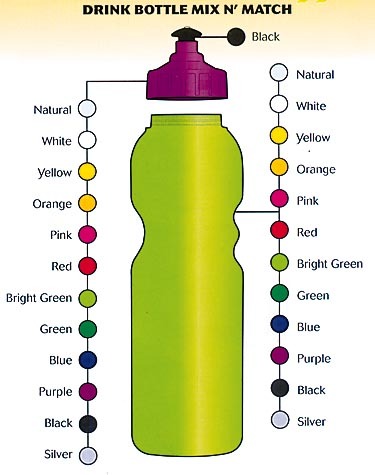 The bottle colours include: Gold, Silver, Bronze, Copper, Rust (metallic orange), Metallic Green, Metallic Light Blue, Metallic Purple, Metallic Red, Metallic Charcoal (graphite). WHILE STOCK LASTS. We can also make bottles of most colours but will need a large run and will need to be specially programmed into production. We can match against specified PMS Colours. If you want a special run (not run in conjunction with other hydromax) there is a $200 extra setup charge) - this is only available for Sure Shots and Hydromax. Minimum run for special colours - 2000 bottles. Note special $2 off doesn't apply to new bottles made. Lid Colours Available: See Mix n’ Match colour combinations below. Printing is not available on this product. Print Area 100mm x 50mm. World first flashing drink bottles that emit an array of red, green and blue light form powerful LED's with 3 different display sequences. The most novel prmotional product of all time that will guarantee your brand is the centre of attention. The cap has non replaceable batteries tested for up to 50 hours of coninuous use. Replacement caps are readily available. Can be used as a safetu light for waling, running or cycling at night. FEATURES 600ml bottle that features the patented X-Stream� non drip self sealing lid. Has optional clear over-cap which costs extra, you can have it with or without the over-cap. COLOURS; Bottle: White, Silver, Translucent Clear, Translucent Yellow, Translucent Orange, Translucent Red, Translucent Green, Translucent Blue, Translucent Purple, Black. Click here to open another window which will mock up the various colour combinations. Recylcable 750ml drink bottle made from BPA free Tritan co-polyester which is impact and shatter resistant. Tritan is diswasher safe and odour resistant. Available with the choice of 3 lid styles and can be supplied with an optional carabineer. Colours - All translucent: clear, yellow, orange, red, green, blue, purple, black. Product Size: dia 70mm x Height 290mm. Print Area: Pad 45mm x 45mm, Screen 122mm x 170mm, one colour only. Three Different Lid Options: Left to Right, The Carabineer Lid, The Sipper Lid, and the Flip Valve Lid with drinking straw. Recylcable 750ml drink bottle made from BPA free Tritan co-polyester which is impact and shatter resistant. Tritan is diswasher safe and odour resistant. It has a unique, leak free, flip top spout and straw for easy no-ess use. Can be supplier with an optional carabineer. Product Size: dia 75mm x Height 235mm. Print Area: Pad 45mm x 45mm, Screen 210mm x 60mm, one colour only. Dimensions: Dia 70mm x H 280mm (exlcuding lid). Nomad Eco Safe Stainless Steel Drink Bottle, EPI Code 105286 (Standard) or EPI Code 105955 if printed full colour. 750 ml food grade stainless steel drink bottle with your choice of 12 stunning bottle colours and 3 unique lid styles. Can be supplied with an optional carabineer and is dishwasher safe. Dimensions Dia 73mm x H 207mm. 600ml dishwasher, safe stainless steel drink bottle with a push/pull sipper cap complete with a secure over cap. All materials used are recyclable and BPA free. Assembled: W 285mm x H 330mm x 178mm. Folded down W 285mm x L 330mm x 58mm. Note EPI Plastics also has a bottle carrier that can't be branded that might be more economical than this if you are only after a 6 x carrier. Click back on homepage and click through to our kitchen manufactured products. Dia 101mm x H 159mm. We prefer electronic artwork wherever possible as this produces a much higher quality print result. We prefer vector line art editable files in EPS, Coral Draw, Freehand, PDF. Generally, TIFF, JPEG, BMP, GIF, and DOC formats are not acceptable, but please ask and we may be able to get your artwork to the suitable standard and file format for printing. We want to make this side of things as painless as possible. The printing setup cost is generally $66.50 which includes the first 1/2 hour of artwork setup etc (normally this is the case). Additional artwork $75.60 p/h This information goes for most promotional products which EPI can supply you with. The per unit cost for printing will depend on the product and how many colours you want.